In many ways today’s ONS figures on household indebtedness are unremarkable, given we are increasingly accustomed to figures showing high levels of household debt. By and large the debt burden is continuing to increase. One in five households report financial (i.e. non-mortgage) debts are a ‘heavy’ burden. Over 2008-2010 median debts for 16 to 24 year olds was £1,540; in that period, they had the lowest level of indebtedness of all age groups, apart from 65+. 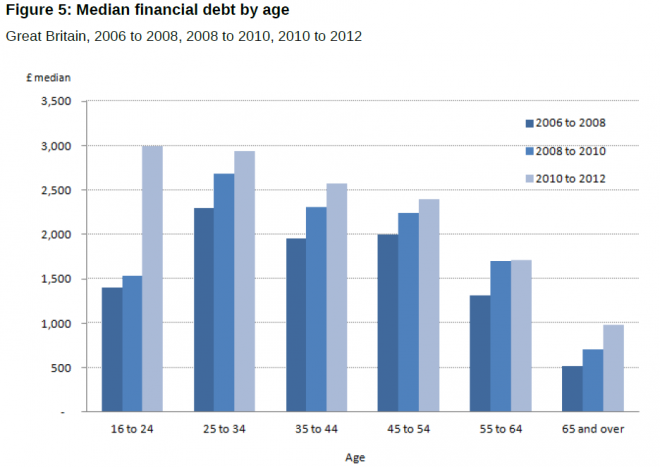 In 2010-2012, debts had doubled to £3,000, and this is now the highest of all age groups. ONS are not yet able to provide an explanation of this extremely sharp change, but it seems likely to be partly related to the increase in student fees. The analysis puts into sharp relief the sheer scale of indebtedness that young people are taking on. This blog post originally appeared on ToUChstone and is cross posted here with permission. Work areas: Economy and Industry, Inequality. Tags: austerity, economic alternative, fair economy, income, inequality, living standards, poverty, young people.